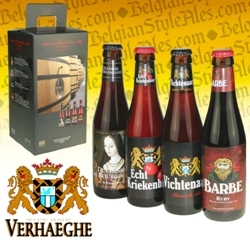 The Authentic Flemish Sour Ale Sampler contains four 11.2 oz bottles from Verhaeghe Brewery -- one each of Duchesse de Bourgogne, Echt Kriekenbier, Vichtenaar and Barbe Ruby. Duchesse De Bourgogne (ABV 6.0%) is a bottle conditioned blend of mature and young sour ales matured in oak barrels for 18 months. It pours a dark brown color with a thin tan head. Aromas of dark fruit, bread, apple, toffee, vanilla, and tart sour cherries give way to a flavor profile that charts a similar course and also includes vinous notes of red wine, oak, malt and chocolate. 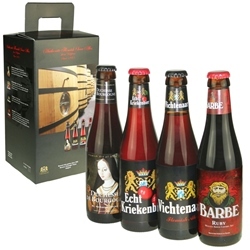 Echt Kriekenbier (ABV 6.8%) ("real cherry beer") is as the name suggests a cherry beer that is made with only the real fruit of cherries instead of with flavor enhancers or extracts of cherries. The fruit is sourced from the region around Sint-Truiden in Limburg (Belgium). The base beer is not a Lambic but a West-Flemish red-brown ale aged in oak wood. About mid-July at the picking, the cherries are laid on the base beer. Because the taste of the fruit varies from year to year according to the number of hours of sunshine or rain, the current year's brew is blended with one- and two-year old cherry beer to achieve a consistent quality. Vichtenaar (ABV 5.1%) is brewed with deeply roasted malt, spicy and fruity hops, yeast, and pure, soft water pumped from a 172 m deep well. After the main fermentation and the second lagering the beer undergoes a third fermentation in oak casks for several months. A traditional and typical West Flanders beer, the dark reddish-brown, well-carbonated Vichtenaar tastes tart, sweet, and complex as a result of its long fermentation in oak. It is fresh-tasting and thirst-quenching. Barbe Ruby (ABV 7.7%) pours a deep crimson red with a reddish-tan head. Aroma is sweet and tart with black cherry and almond aromas above undertones of malty caramel & brown sugar. Taste is similar, with mild acidity and good carbonation for a crisp and dry mouthfeel. Nicely balanced and easy to drink. I sent this to my daughter for Christmas and she loved it.